BioLink AMIS is easily customizable, fault-tolerant and price-affordable, implies low development and implementation costs and requires little or no experience in biometrics. It is also advantageous for its robust performance and supreme speed (hundreds of thousands of matches per second). Provides 1-to-many fingerprint searching for enrollment or authentication. It also provides dynamic storage of all fingerprint templates in RAM and persistent storage of all 1-to-many matching algorithms. The Management Server(s) acts as the control front end and transaction manager to the ACA and is the hub of AMIS. Provides permanent storage of the client’s specific information as for fingerprints, face images, and demographic information. Currently, AMIS supports the following databases: SQL, Oracle, Informix, DB2. Web services are self-contained applications that can be published and invoked across the Web using XML-based protocols. BioLink Web Service allows clients to perform search in the BioLink AMIS fingerprint database as well as insert, update, and delete data. The end application can access Web Service through an XML-based SOAP protocol using any SOAP library for any platform. Administration of AMIS components is provided through a Windows based administration workstations. Administrators can configure ACA Server Blades, Management Servers (CFE’s), as well as machine and user access security settings. 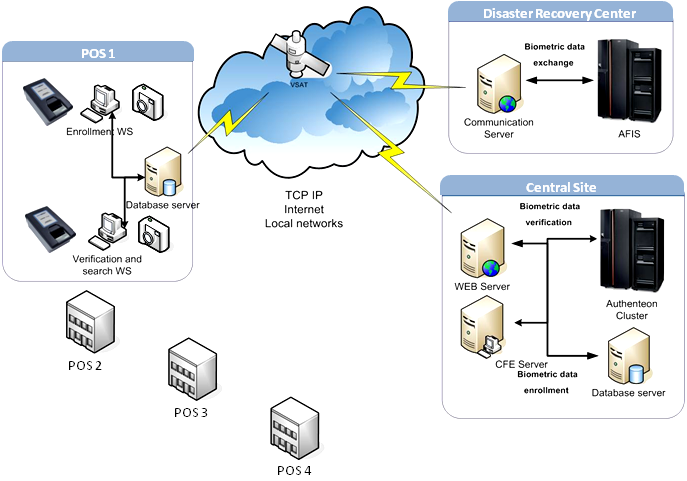 The system architecture displayed below summarizes the approach for the deployment of all BioLink AMIS components in the distributed operational environment.